First-Hand News of New Releases, Giveaways, and More! Here's where you sign up to receive First-Hand News of New Releases, Giveaways, Writing Posts, and more! 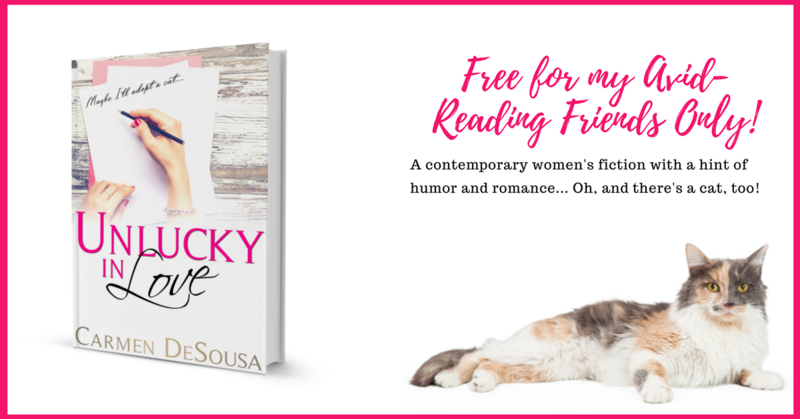 Plus, this month only, I'll send you a FREE copy of Unlucky in Love, a contemporary women's fiction with a hint of romance and humor. If you have a question, feel free to reply to any newsletter. I love chatting with readers, so I manage my own email. NOTE: I do not and have never collected any personal information from you, nor do I sell your name or email to anyone, ever. I only send you an email when I have news or a new release. You can opt out at any time. You can change your mind at any time by clicking the unsubscribe link in the footer of any email you receive from us, or by contacting us at Carmen@CarmenDeSousa.com. We will treat your information with respect. For more information about our privacy practices please visit our website. By clicking below, you agree that we may process your information in accordance with these terms.